In all types of businesses, it’s useful to measure performance against a set of predetermined criteria. 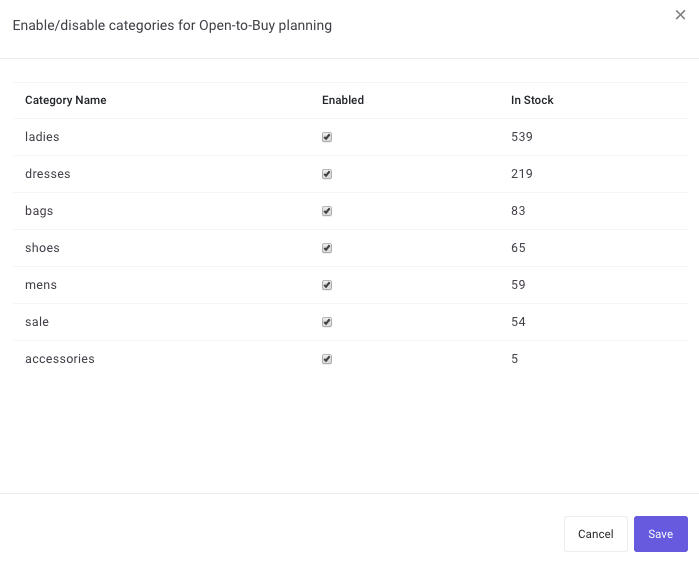 An open-to-buy plan is an inventory management tool that helps you figure out how much inventory you need to buy on a monthly basis to make your sales projections. Most retailers use product categories for planning rather than analyzing hundreds of individual products. This is possible because products in a category usually behave in a similar fashion. 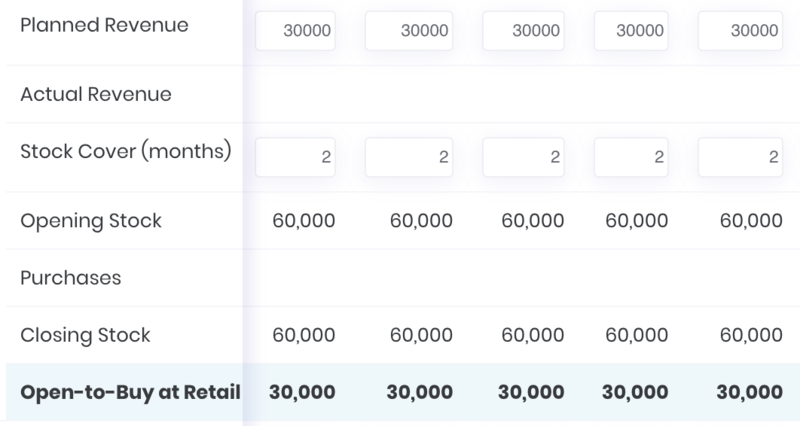 Set the planned revenue for categories or the entire store. 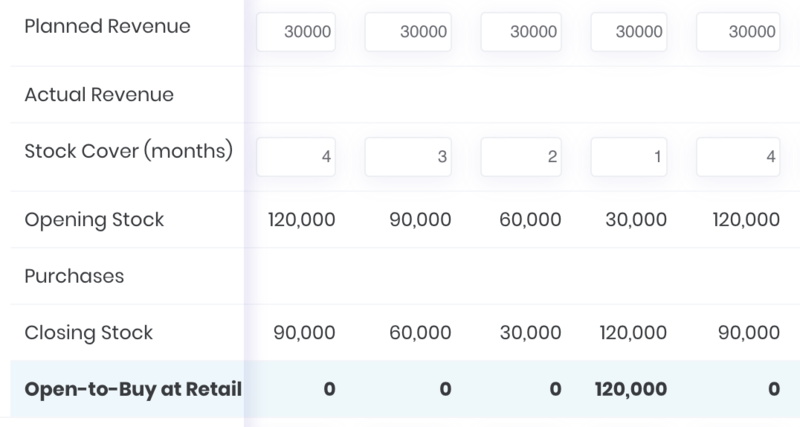 When the planned revenue is set for the entire store, Inventory Planner automatically sets revenues for categories based on the last 2 month sales distribution. It's important to have mutually exclusive categories (they must not contain the same products). 2. Set the stock cover in months for categories. Stock cover is the retail value / planned revenue. You can use the current number as the basis reducing it if you know that you're currently overstocked or increasing it if you have a lot of stockouts. For the example above we have enough stock till the 4th month but in order to start it at $120,000 at retail we need to bring in $120,000 worth of stock. Otherwise the stock will be $0 after the 4th month. 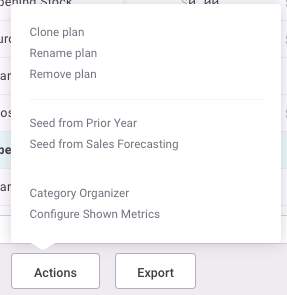 Planned sales can be seeded automatically from the last year or the forecasted sales. Click Actions at the bottom of the page to see seeding options. Inventory Planner allows you to create open-to-buy plans in cost and units. Planning in inventory cost gives you the actual budget to spend on each category. Planning in units helps you to estimate if you have capacity in your warehouse. To get the OTB at cost, enable cost-based fields in the report by clicking at Actions > Configure Shown Metrics at the bottom of the page. 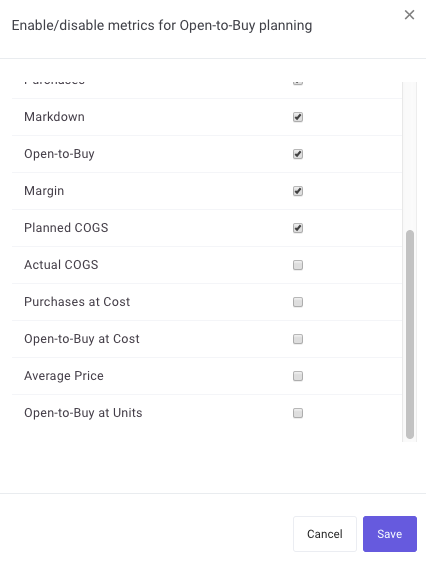 To get the OTB at units the average product price should be set. If you’d like to exclude obsolete categories from planning use Actions > Category Organizer. You can also create different versions of a plan for “what-if” analysis. It helps to simulate what will happen if you have more sales or your stock days changes. Retailers use this modeling to understand the impact of moving performance variables and their impact ultimately on cash flow.